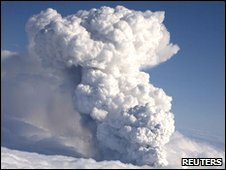 The UK Health Protection Agency (HPA) has said that the cloud of ash from Iceland's recent volcanic eruption is not a significant public health risk. The plume of volcanic ash has grounded flights across the UK, but the HPA says that it is "trapped" in the atmosphere at high altitude. The agency will continue to monitor the the plume's movement. It says that it does not expect the plume to touch ground over the UK in the near future. "Even if the plume does drop towards the ground the concentrations of particles at ground level are not likely to cause significant effects on health," said the agency in a statement. "Rainfall over the UK could cause a small amount of the ash to be deposited over the country but quantities are expected to be too small to cause health effects." The Met Office confirmed that the current high pressure conditions over the UK were "resulting in the ash cloud remaining at high levels in the atmosphere with little possibility of any reaching the ground". Wednesday's eruption occurred near the Eyjafjallajoekull glacier. The glacier water melted by the ongoing volcanic activity in the region generated large volumes of steam, which made this latest eruption explosive. The explosion blew out a plume of gas and fine ash particles, which were transported high up into the atmosphere. Scientists have pointed out that, at ground level, volcanic ash can cause serious health problems. Dr Dougal Jerram, a volcanologist from the Department of Earth Sciences at Durham University explained: "One of the most influential ever eruptions was the 1783-1784 event at Laki in Iceland when an estimated 120 million tonnes of sulphur dioxide were emitted, approximately equivalent to three times the total annual European industrial output in 2006. "This outpouring of sulphur dioxide during unusual weather conditions caused a thick haze to spread across Western Europe, resulting in many thousands of deaths throughout 1783 and the winter of 1784." Following that event, many people reported seeing a "volcanic haze" near the ground. The current ash plume is not visible from ground level. This was also a much smaller eruption and scientists have said that this is a relatively diffuse ash cloud that will blow away within one or two days.